Embrace the cheer of the season with these four family-friendly Lansdowne Resort and Spa holiday events! Every place around Virginia is lit up with holiday cheer right now, and there's plenty of holiday-themed things to do. Sometimes it's hard to know what to check out first. However, if you're in the Leesburg area, here are four Lansdowne Resort and Spa holiday events we think you should keep in mind! WHEN: Fridays | 5 to 9 p.m.
Let the Holiday Explorer's Club entertain your little ones (or bigger ones) for a fantastic few hours while you get the chance to sneak away and cross some things off your to-do list! Your kids can come to Lansdowne and enjoy some hands-on experiences and watch holiday movies in their amphitheater. By the time you pick them up, they should be more than ready to call it a night! WHEN: December 8, 15, and 22-31 | 10 a.m.-3 p.m. Your kids can make a cuddly snowman (or another lovable creature) from start to finish with this event! They'll be able to pick, stuff, and dress a little friend to take home with them for the holiday season. And they'll also have the chance to do the same for someone else! They can build another stuffed animal that'll be sent to the Story Book Treasures organization where kids will receive them with books to increase literacy across the U.S.! WHEN: December 8, 15, and 22-24 | 10 a.m.-3 p.m.
What can be more holiday-themed than crafting your own ornaments?! You and your family will be given wooden ornaments to decorate to your heart's desire. Don't worry about bringing anything but yourselves because all the materials will be provided, too! WHEN: December 8, 15, 22, and 27 | 11 a.m.-5 p.m.
Load the car up and prepare to meet some cute, wintry creatures that are rumored to be Santa's from the North Pole (the kiddos will love this tidbit)! You can lay your eyes on doves, white hares, alpacas, and goats -- and if your children are 10 and under, they can pet and interact with the creatures, too. Also, it doesn't hurt that this fun-filled day is completely free! 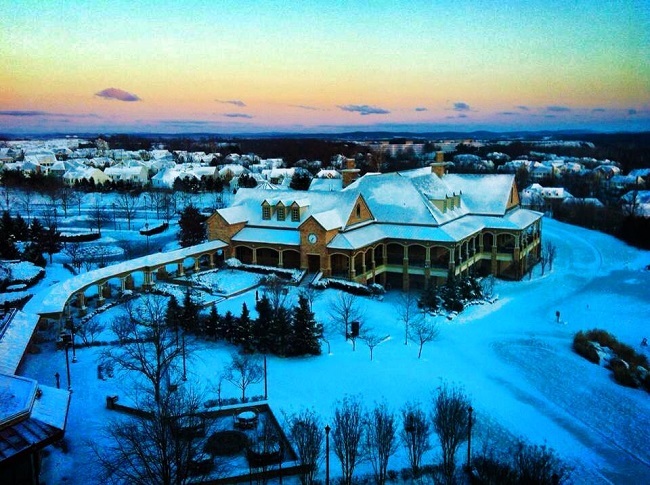 Do you plan on checking out any of Lansdowne Resort and Spa's holiday events this year? Which one do you think your family would love most? Drop a comment to let us know! Have you been to Busch Gardens this holiday season? Christmas Town is everyone's dream come true!